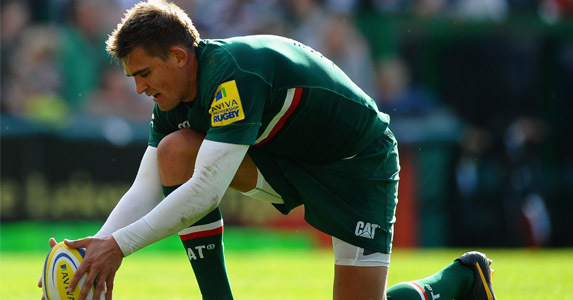 THIS WEEKEND second place Northampton Saints take on third place Leicester Tigers in the fifth round of the Aviva Premiership at the Tigers’ den, Welford Road. It will be the first meeting between the two sides since the Premiership final in May in which Tigers were victorious, and for their captain Toby Flood, there will be no love lost in the Midlands on Saturday at 3:15pm. Toby was speaking at the home of Bowdon RUFC’s under-12s, near Manchester. They were the lucky recipients of a training session from him as part of a special prize won at last season’s Sale Sharks Land Rover Premiership Rugby Cup. Read all about Leicester Tigers’ preparation for the Heineken Cup with Toby Flood’s Leicester and England teammate Geoff Parling in the November edition of Rugby World – out now!